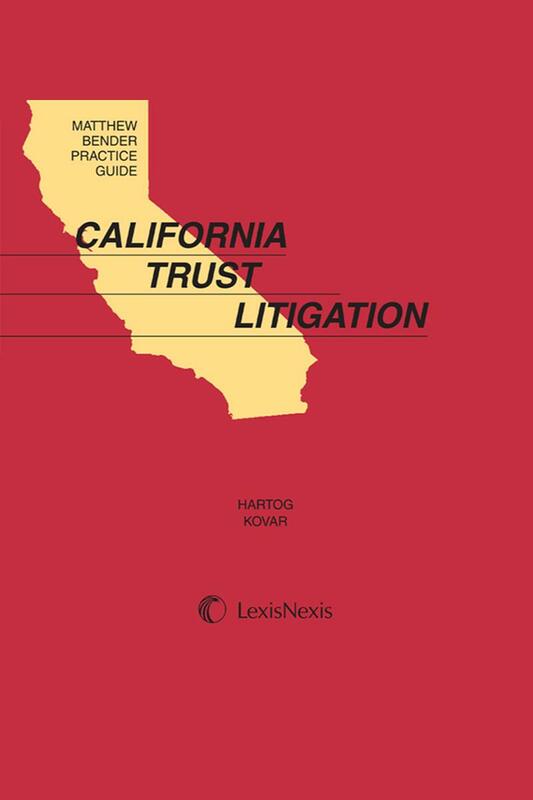 Matthew Bender Practice Guide: California Trust Litigation is the definitive source of information on litigating trust disputes in California. • Proceedings attacking the validity and/or existence of a trust (trust contests). • Disputes involving the ownership of trust property. • Petitions for instructions relating to the operation of a trust. • Compelling a trust accounting. • Suits involving claims of breach of duty or malfeasance by the trustee. • Removal of a trustee. • Related matters such as financial abuse of an elder or dependent adult by a trustee, case evaluation, ethical issues, the recovery of trustee and attorney's fees in litigation, and the mediation and settlement of trust disputes. 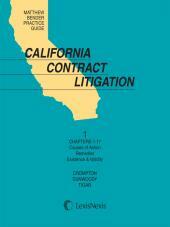 Trust litigation can be a highly lucrative field for California attorneys. However, it presents unique issues and procedures that set it apart from other types of general civil litigation, and presents many pitfalls for the unwary and inexperienced. This publication gives estate planners and general civil litigators the basic guidance that they will need to expand their practice into trust litigation, as well as serving as a handy reference source of up-to-date practice information for experienced estate litigators. Matthew Bender Practice Guide: California Trust Litigation establishes a new standard in practice guides. You'll find streamlined chapter organization, precise guidance on finding pertinent online information, cross references to additional relevant content, and Strategic Points, Warnings, and other types of practical tips highlighted by icons and headings that classify the tips by type so you can tell at a glance what type of information you will find in the tip. You can be sure you are fully prepared with the step-by-step guidance of checklists and the ready availability of time-saving forms. Cross references give you instant access to relevant cases, statutes, rules, public records and secondary sources that include Matthew Bender's indispensable online publications. And with updates twice a year, you'll always have fast, accurate and up-to-date answers to procedural questions. Matthew Bender Practice Guide: California Trust Litigation offers expert analyses, procedures, forms, and references for total research and guidance support. Matthew Bender California Practice Guides redefine what first-class research support is all about. These peerless dual media tools combine the convenience of the printed word with the reach of online access to help you work smarter and faster, and get more of what you're searching for easier. With each Practice Guide, expert task-oriented analyses are just the beginning. Checklists, practice tips, examples, explanatory notes, forms, cross-referencing to other Practice Guides and online linking to Matthew Bender's vast suite of publications all combine to deliver the fast, full and confident understanding you seek. Featuring more of what you're looking for in a comprehensive research system--a task-based format, thorough yet concise content, citable expert insight, twice-a-year updating, a superior print/online interface, sample searches and so much more. Matthew Bender California Practice Guides will help lift your efforts to a whole new level of success. John A. Hartog possesses particular expertise in counseling trustees administering living trusts and in resolving disputes among beneficiaries and fiduciaries. Mr. Hartog also serves as a mediator in trusts and estates disputes. He is a fellow of the American College of Trust and Estate Counsel and certified by the California Board of Legal Specialization as a Specialist in Taxation Law and in Estate Planning, Trust and Probate Law. He is a former chair of the Executive Committee of the State Bar of California’s Trust and Estates Section and a past Chair of the Estate Planning, Trust and Probate Law Advisory Commission to the California Board of Legal Specialization. Mr. Hartog has been selected to the Super Lawyers® Top 100 list by his peers for six consecutive years. He is co-author of the LexisNexis Matthew Bender publications California Trust Practice and California Wills & Trusts, and the author of numerous published articles. He is also a legal consultant to the California Wills and Trusts document assembly program. He has served as a lecturer at the University of California, Berkeley Law School where he taught “Wills and Trusts.” Mr. Hartog has lectured at the ALI-ABA Advanced Estate Planning Institutes, the California CPA Education Foundation, the UCLA-CEB Estate Planning Institute, the USC Probate and Trust Conference, the Chaminade University Hawaii Tax Institute, and other sponsored programs from Boston to Honolulu. He holds an LL.M. (Taxation) from Golden Gate University of Law, his J.D. degree from Hastings College of the Law, and his B.A. degree from Pomona College. Shirley L. Kovar’s practice focuses on complex trust and estate disputes, including international trusts and estates litigation. Ms. Kovar is a Certified Specialist in Trusts and Estates, by the State Bar of California Board of Legal Specialization. She is a Fellow of the American College of Trust and Estate Counsel (ACTEC), where she has chaired the Transfer Tax Study Committee. In this capacity she gave oral and written testimony before the U.S. Senate Finance Committee on federal estate tax reform in April 2008. She is presently a member of ACTEC’s Litigation Committee. She has served as Chair of the Litigation Committee for the Executive Committee of the State Bar Trusts and Estates Section (TEXCOM), where she also served as the Liaison between TEXCOM and the California Law Revision Commission on no contest clause reform. Ms. Kovar is also an Academician in the International Academy of Estate and Trust Law. Her international activities have included a presentation on settlement agreements to international attorneys in Salzburg, Austria. She has been selected as a SuperLawyer (top 5 percent of lawyers in Southern California) from 2007 (when the award was first given) through 2010. Other honors include election to the Board of Governors of the University of Kansas Law School (two terms). Ms. Kovar has twice given presentations at the Annual Meeting of ACTEC Fellows, as well as other numerous CLE presentations, including the University of Southern California Annual Conference. She has written extensively in the areas of trusts and estates disputes and federal estate tax reform. Ms. Kovar graduated in 1974 from the University of Kansas Law School, where she was elected to the Order of the Coif, as Editor-in-Chief of the Kansas Law Review, and was co-recipient of the Samuel Mellinger Award, awarded by the law faculty for Leadership, Scholarship and Service, and by the University of Kansas as Outstanding Woman Graduate in Academics for all graduate schools at the University of Kansas.